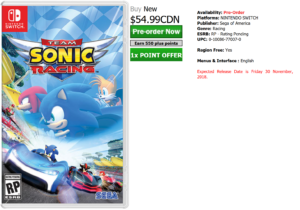 A Canadian website called Video Games Plus has apparently put out an expected release date for Team Sonic Racing, set for November 30th. The current state of TSR is that it will come out in the Winter of 2018, which is right in the range of the date. However, it is odd that it is set this late in November, considering that most Sonic titles are released before Thanksgiving holidays. We will probably get an actual date in the coming months, but at least we have some sort of time frame for when this game will come out.